In "Rejuvenating Source Energies" you are given the experience of receiving direct therapeutic energies from Source for your mind, body, and emotions. After giving to so many all day long, this is one place you can go to receive the nourishment and replenishment you need. "Rejuvenating Source Energies" is a wonderful gift for women who give and give and give: to their families, friends, and all those around them. You are invited to receive now, and to be given plenty of rejuvenating, loving-light. This is all we need to replenish ourselves whenever we need to, and as we do so, we provide for any unmet needs within ourselves, whether it be for our minds, bodies, emotions, or spirits. "You are being nourished so beautifully now, replenished with all the Light and the Love that your cells need to continue to thrive in a healthy and powerful manner. Your inner health so often depends on these moments of peaceful rest that you choose to give yourselves on a daily basis." We were told very specifically that our health and well-being could be powerfully nourished and replenished through the loving Light from Source. "When you allow yourself these quiet moments of rest, you allow God in, into your body, to rejuvenate your cells and to bring you once again a greater dose of the life force that keeps you thriving so well. These great doses of pure Love Light are full of energies that would replenish any and all of your systems as needed." When we know that we can receive and be replenished in this way, it becomes so much easier to know that we will always have a source of replenishment to use as needed when we are feeling depleted in our lives. "Janice: I’m just in bliss right now. I don’t even want to move! Janice: It was wonderful. You said you may see things… like umm, like little neutrons or something… little…. just little…. things just…you said we might see things, but I’ve never seen this. It’s like, it’s almost like the little neutrons connecting… it’s strange. And they’re moving around in a really, really fast pace. Suzanne: You saw them in front of you or in your mind? Janice: In my mind, mm hmmm. Suzanne: Maybe they’re rearranging some things in there! Janice: Oh I hope so! (laughter) And they looked like pretty much they were working hard! Suzanne: Did they have any colors, those dancing orbs? Janice: Ya, they were almost like a um…a real, real, pale…pale, like, I want to say a lilac colour? Suzanne: mmmmmm. That’s what they are for you, dear, dancing orbs! Janice: Ohhhhhh! They were putting on a show! Suzanne: Perhaps they’re working on the crown chakra there. Suzanne: Well I’m going to let you go back and just let them… like they’re really doing a reconstruction job on that crown chakra. Suzanne: Ya! Reconstructing! Ya—shoring up that bridge for you. How nice! Janice: Probably disconnecting some bad things and connecting some really good stuff. Suzanne: Yup. You’ll have a brand new bridge in no time at all. Suzanne: Thank you for sharing, Janice. Each participant has a completely different experience. Some, like Janice, are here for the first time, never having experienced this before. Others have been part of our ongoing group for a long time. I was still receiving while the conversations were taking place, so I left the conference. Once again THEY and THEIR GIFTS were everything and more than what I wished for. Thanks for facilitating. It is so nice to be on the receiving end and not thinking about the needs of others. ​And here's something from Pam, who's in our Orange Carnelian Group. Our group is specifically for sharing and working with these downloads in a clear, community-based format. We share our results and support each other's growth by listening to each download daily and reporting back with shifts and changes! 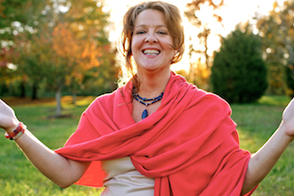 Because Pam is in our group, she receives this audio as a polished meditation with music, exactly 30 minutes—perfect for meditating and receiving! "Suzanne, thank you so much for this recent meditation. I had two great experiences so far while listening. One is that I could actually feel my cells soaking in light and energy. I love the spiritual connection all of them bring. Last night I had one of the best dreams ever. I was directing cars, basically helping others in their cars to find their way. I was in such a great place I did not even need a car to get where I was going. How cool is that? Another cool thing is that I applied for yoga teacher training today, and what struck me was how easy the application questions were to answer when only six months ago the questions seemed daunting. All is as it should be. Sending you a giant virtual hug!!!" 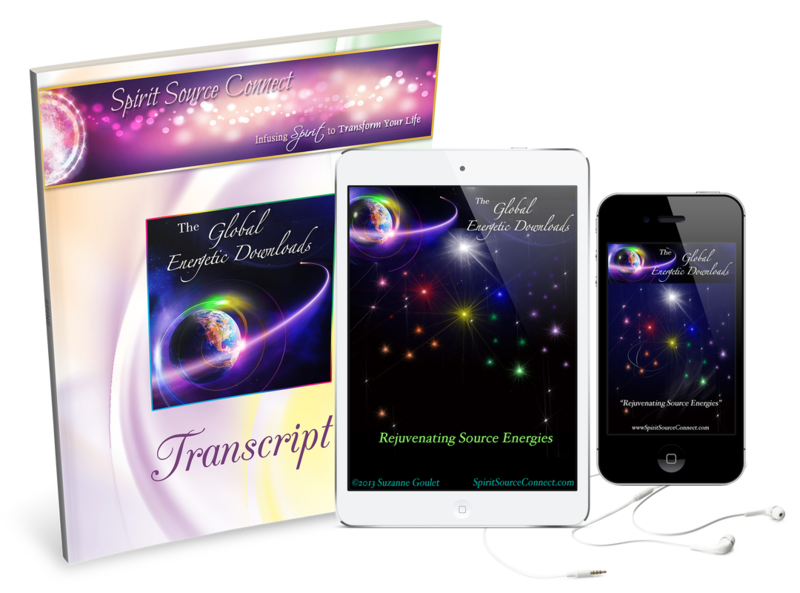 This energetic download was specifically geared toward women who give and give and give and forget that they themselves would really benefit from being able to receive from a really high Source. And we can do it daily now! 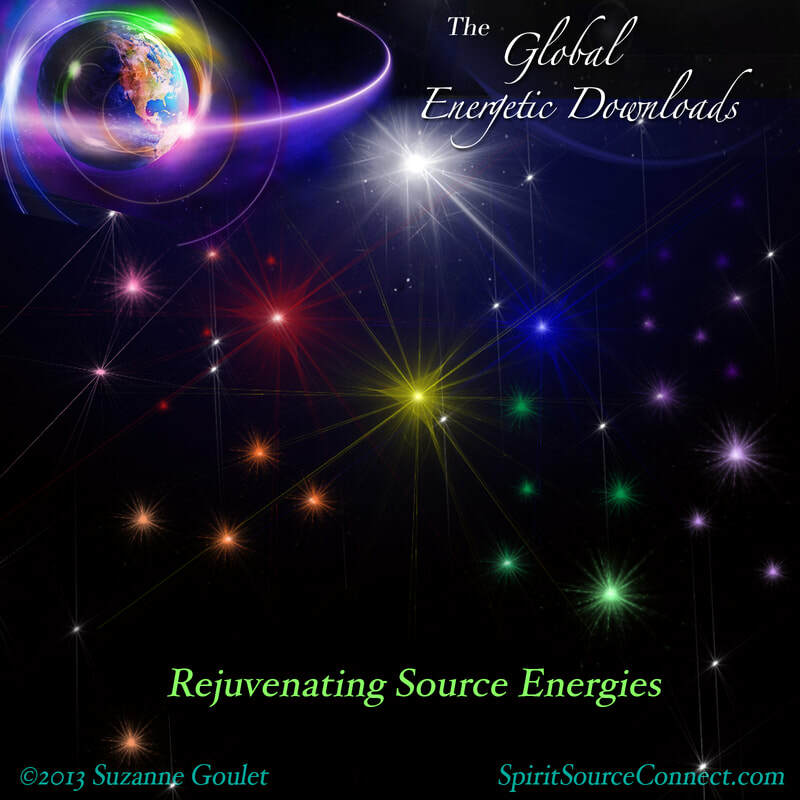 With your purchase of "Rejuvenating Source Energies," you gain immediate access to .mp3 audio files, have a CD mailed to your address, and receive a beautiful, printed transcript of the enlightening guidance as well. Many have kept these transcripts to read and reread over and over, providing them with reminders, inspiration, and upliftment.